Kingdomino is a board game that every gaming family should own. If the best games on your family’s gaming shelf are Monopoly, Uno, Life and/or Trivial Pursuit, then it’s time to upgrade your collection. And Kingdomino is a great place to start. 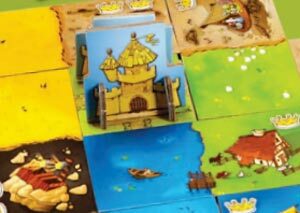 Kingdomino recently won the coveted “Spiel des Jahres” for Game of the Year – 2017. The Spiel des Jahres (German for Game of the Year) is an award for board games – given out annually for the best Family Game each year. The Spiel des Jahres is basically the Academy Awards for Family Board Games. 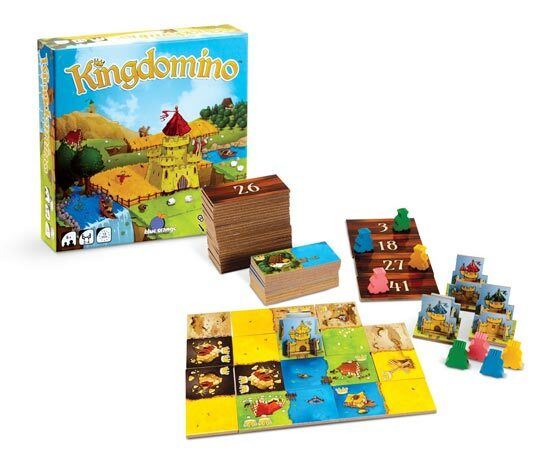 Kingdomino is an upgraded version of the old game – Dominoes. If you don’t know what a Domino is, maybe you’ll recognize the one that Domino’s Pizza uses in their logo. I’m not sure if kids even know how to play Dominoes anymore, so here’s a rough intro to Dominoes: Dominoes is a tile-laying game that’s been around for hundreds of years. Players take turns matching ends of their pile of Domino tiles to Domino tiles already in play. If you have a domino with 2 pips (2 dots on it), you can only match it to another Domino in play with 2 pips. You basically try to play as many Dominos from your hand as possible. In Kingdomino, the dots/pips have been replaced with a variety of landscapes/terrains. You have six different landscapes that replace all the dots in Dominoes: Water; Forests; Mountains; Wheat Fields; Swamps; and Grazing Lands. 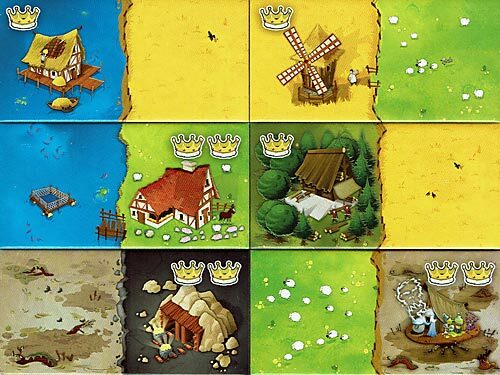 Below is an image of 6 Kingdomino tiles representing all 6 types of terrain in the game. To Connect your dominoes in order to build a 5×5 grid to score the most prestigious Kingdom of all! Kingdomino is played with 2 to 4 players. Each player starts with a 3D castle. This 3D castle is wild. Any landscape can connect to the castle. Each turn, players connect one new domino tile to their existing kingdom, making sure at least one of its sides connects to a matching terrain type already in play (or the 3D Castle). You continue to build your kingdom until you have a 5×5 grid (if you’ve planned well). Your Kingdom cannot exceed a 5×5 grid. And your 3D castle does not have to be in the middle of your kingdom. There are a total of 48 Dominoes in the box. You would use all 48 tiles in a 4 Player Game. The tiles are two-sided. One side of the domino has a number on it (ranging from 1-48); the other side is the terrain. Lower numbered tiles are generally less valuable at the end of the game than higher numbered tiles. Players will take turns drafting one tile each round and add it to their Kingdom. The player who drafted the lowest numbered tile the previous round, will have first pick in the next round’s draft. This makes drafting fun and fair. When players have a 5×5 grid in front of them, the game is over. If due to bad planning, you can’t fit a tile into your kingdom, that tile is discarded from play. Great Price Point! This game retails for only $19.99. And can sometimes be found cheaper. Click here to check the current price on Amazon.com. Easy to teach. You can teach anyone this game easily in just a few minutes. The box says ages 8 & up, and this seems accurate. Quick Gameplay: This game only takes 15 to 20 minutes to play. Drafting: I love drafting games. You can somewhat control your own destiny by drafting smart each round. If you go for something valuable one round, you’re probably going to get stuck with something less valuable the next round. It’s a constant trade-off you have to plan for in your kingdom. Building your kingdom: There’s something satisfying to completing a perfect 5×5 grid even if you don’t win the game. No player elimination: Everyone plays until the end. And you don’t necessarily feel “out of winning the game” until final points are tallied. Option to build bigger kingdoms! If there are only two players, you can opt to build 7×7 kingdoms. 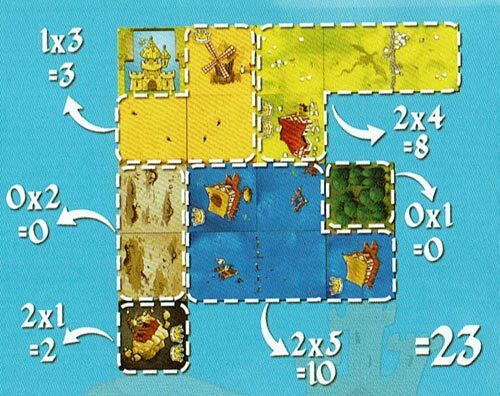 Or you can even combine two sets of Kingdomino for 4 players so that everyone can build a 7×7 gridded kingdom. Replayability: This is a game that is easy to come back to. Since each game plays differently, the game doesn’t get stale. Portability and Storage: The box is nicely sized at 7.5″ x 7.5″. Artwork. The whimsical artwork is cute. It’s fun to try to figure out what’s going on in each Domino. They’ve actually made a giant version of this game so that you can see the artwork easier. Rulebook is in full color, with great directions. Too light? Some folks might think this game is too light for them. If you are looking for a deep game that takes 60-120 minutes to play, then this game is not for you. (Except maybe as a filler game between those other deeper games). Not for large groups: This game only plays up to 4 players. The only way to make it possible to play with more than 4 players is add another copy of Kingdomino to the mix, or actually mix in the newer Queendomino board game (review coming soon). Cardboard Dominoes – As the game is only $19.99, the Dominoes are made of thick cardboard. The cardboard stock is actually very nice. This is probably the only way to get all the cool art on each domino, but you almost wish they were made of something more solid and water/beer proof. This is an easy game to recommend to everyone. The price is right and doesn’t break the bank at its $19.99 retail price. It plays quickly and is easy to teach. It’s a great game to teach to non-gamers. I feel this this is a game that every gaming family should own. Make room for this one on your game shelf! This game has been rated 5 out of 5 on Amazon.com as well!